Is it a sweet potato or is it a yam? Is sweet potato pie really made from yams? Are candied yams really made from sweet potatoes? I think I know the answer but I’m still confused every time I go to a store that labels them incorrectly, which seems to be practically every store. There are two common varieties in American supermarkets that look like potatoes but are sweeter and much more nutritious. The first has a dark, thin skin and a very orange interior. It has much more pointed ends than a regular potato. I’ve seen this labeled as both a yam and a sweet potato. This is the one commonly used to make sweet potato pie and candied yams. The other variety is shaped like a large russett potato but with skin colored like a yukon gold. The interior is more yellow than orange and much tougher to cut than a regular potato. I’ve seen this also labeled as both a yam and sweet potato. This is what I used for the recipe below. After some research I determined that both of these are varieties of sweet potato. Yams are common to Africa and Asia and are a very different variety of vegetable. 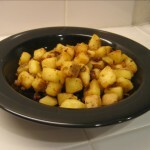 So now that I decided that what I had is, in fact, a sweet potato, I came up with this sweet, smoky and slightly spicy variation on home fries. This was much more interesting than regular home fries and much more nutritious thanks to the sweet potato. Set a skillet to medium heat and start frying the bacon. Once it’s crisp, add the rest of the ingredients and fry over low to medium heat for about 20 minutes or until the outside is slightly brown and the sweet potato cubes are cooked through. Add salt and pepper to taste and serve. This is a recipe that benefits from caramelization. 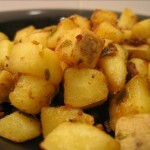 The more brown and crisp the potatoes are, the tastier this dish will be. A non-stick skillet would probably work best. You might also need more fat than the bacon provided. You could also easily make this vegetarian by substituting olive oil for the bacon.